One of the great things about living in California is just when you think Summer is over, you can get hit by a hot spell in the middle of October, even late November. An opportunity not to be missed. Saturday Oct 8th, was one of those days. 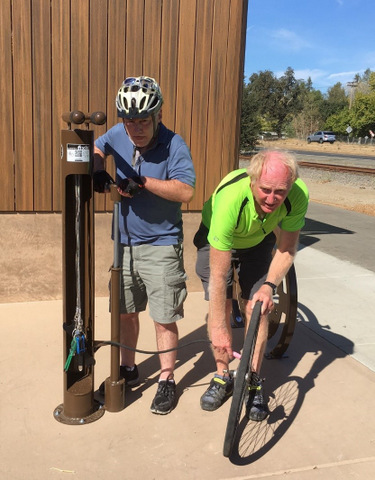 I was invited by Philip Sales, NVVT Executive Director, to join him on bike ride along the prestigious Napa Valley Vine Trail (NVVT) from John F Kennedy Park in South Napa to Yountville, to preview the completion of 12.5 miles of the NVVT trail. I met Philip around 10 am by Hartle Court (Off Imola Ave behind the Century Movie theater) just in time to witness the first “Walk with the Doc” program organized by NVVT’s Melissa Serpa and led by Dr. Lynette Leighton of ‘OLE Health’ in Napa – this month’s doctor walk and chat was about Breast Cancer. As the DOC walk was finishing, we were joined by Philip’s friend, Greg, an attorney and former President of the State Park Association for Sonoma and Petaluma, it was his first time on the trail. I also had invited a friend, who has been known to be late, on occasions. Philip and Greg were keen to be off, we could tell it was going to be a hot day, a high of 90F was predicted. So, they set off while I waited for my friend who said he was on his way. By 10.30, Eamonn arrived with tales of traffic woes in Sonoma. Eamonn, a hardware engineer and newbie to the trail was impressed already; just looking at the unique design of the Hartle Court bike shelter. Once on the trail, riding north alongside the Napa River, I told some stories of the interpretive signs and mileposts dotted along the trail. The interpretive signs contain historical or geographical information of the area and the mileposts, posted every quarter mile, identify how far along the trail you are and contain logos of the other trails which follow the same route. I am very proud of these, as I have put many of them together. I regaled Eamonn with tales of tamper proof screws and the intricacies of using liquid nails on recycled plastic posts. Eamonn with some urgency, proclaimed that he had caught sight of Philip by the Third Street bridge. We soon caught up with Philip and Greg. Philip was in deep conversation with Greg discussing fiscal budgetary matters. Eamonn, abruptly pointed out the impressive panorama of the old Napa Waterfront and mentioned it was a good kayak launching spot. This section of the Napa Valley Vine Trail has a bit of a hop and a skip to it, after Third Street Bridge. We hit the crosswalk button, crossed Third Street by the old Borreo building currently under conversion to a brewery. We all decided what a great town Napa was – two breweries on opposite sides of the river. The well-established Downtown Joe’s and coming soon, Stone Brewery and Restaurant. Along Soscol Ave just before First Street, an interesting spiral descends to the flats of the Napa river into the Oxbow bypass area where some good bicycle balancing skills are required on the sharp switchbacks. Under First Street bridge and Soscol Ave we approached Mckinstry Street, we were now in the Oxbow area of Napa. Many distractions blurred the eyes, wine tasting, bakeries, burgers, gourmet ghetto, but we were made of sterner stuff and headed north on McKinstry crossing Soscol to Vallejo St where we came upon the up-coming art trail section of the Napa Valley Vine Trail. As of yet, there is not much art unless you count the graffiti; hopefully this will be discouraged once the real art appears. 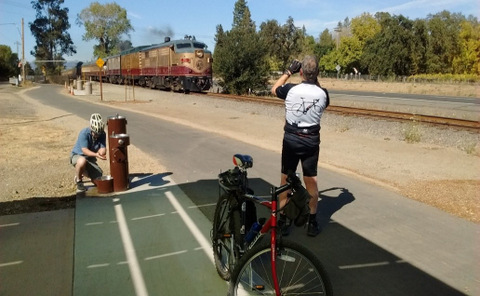 We were now biking parallel to the Napa Wine Train tracks, on the Crosstown Commuter Bike Path. You have to cross several streets including Lincoln, Central, Jefferson eventually crossing Highway 29 along a pedestrian/bike bridge to Redwood/Trancas. We were on the west side of Highway 29 crossing Redwood Rd arriving at the new section of the trail just north of the bus terminal. This section is not yet formally open, as the traffic lights and crossings on three intersections are not yet installed. We proceeded very carefully and watchful of approaching cars from all directions. This will be much easier in the near future, as pedestrian walkways with buttons will be installed later this year. Philip and I continued our talk of the trail to our wide-eyed companions, Philip becomes almost poetic in his talk of his beloved bridge between Trower and Wine County Ave. Due to some construction mis-adventures, NVVT owns the bridge. It’s a long tale, but basically a founder member came up with $100,000 to help pay for it. Noting the parallel railway track, between the trail and Highway 29, Greg talked to us about trains, he is a train enthusiast, he knew all about the Napa Railroad down to the individual carriage sizes, rail gauges, nuts and bolts. Not to be remiss, I started to give my milepost spiel again as Philip and Greg had missed my early conversation about tamper proof screws and liquid nails. For whatever reason, Philip, Greg and Eamonn decided to pedal harder and left me a little behind, maybe they were dashing to get some shade under the distant canopy of the Oak and Eucalyptus trees. We had a vista point stop by the two-bridge section of Oak Knoll, as we were taking photographs who should come into the lens but Jeremy Sill, the Project Civil Engineer with RSA+, cycling by with his son Colton. As we chatted the Napa Wine train approached from the south. Toot, toot! from the engine driver and waves and smiles from the passengers and our happy band of cyclists. It was getting hot, almost time for lunch, we were about to ascend to Yountville Grill golf course restaurant when we bumped into Chuck McMinn and his wife Ann and nephew. Chuck is the Founder, Chairman, Board president of NVVT. We chatted and inspired by Chuck, we decided we needed to show Eamonn and Greg the northern end of the current trail. We biked to California Ave, then under Highway 29 turning left to the end of ‘Yountville Mile’ at Madison Street and the appearance of the R+D Kitchen restaurant immediately satiated our desire for refreshment, a large beer and sandwich came to mind. We ate outside, under the shade of an elegant umbrella and the rather suave well-dressed crowd who did not seem to mind four hairy and sweaty lycra-dressed cyclists. While we were waiting, we speculated on the naming of the restaurant R+D, our corporate minds said Research and Development, our political election minds thought Republic and Democrats. Eamonn held forth with the latest on Trump Campaign carefully watching his language. Political talk can be difficult at the best of times, but with this election you really need a private booth. We enjoyed our rewarding respite at R+D, but we needed to head back. We slowly gathered our things, we had a little over 10 miles to return to our starting point. I headed out first, I had to gather some GPS coordinates using my cell phone (long story) on one of the Info signs. As I was doing it this, I received an urgent call from Eamonn, he was still at R+D, he had a tire puncture and fortunately I had a pump. I biked back to R+D, we could not see any obvious thorn sticking out of the tire, so we just pumped it up hoping it was just a slow puncture. It held, so we headed south knowing that we had Oak Knoll Bike shelter to help if the leak continued. As we were approaching California Blvd, Eamonn noticed something on the ground by the trail, he suddenly stopped and said someone had dropped a cell phone, he picked it up and I quickly noticed that it was mine. Eamonn had redeemed himself, despite causing the rush and probably my cell phone tumble as I came to his rescue. Good friends never get full credit. Eamonn set off at a fast pace hoping the slow puncture would get him all the way to Oak Knoll, would he make it in time? As Philip, Greg and I pulled up to the shade of Oak Knoll Shelter by Silenus winery we saw the hapless figure of Eamonn. His back tire was completely flat, fortunately Philip had a tire patch kit and there was a water fountain attached to the shelter with a fillable dog bowl where we could immerse the inner tube and find the puncture. With the aid of the Shelter’s Bicycle tools we removed the inner tube and repumped the tire, while doing this I bumped my head on the bike rest overhang, from the pictures you can see actual blood. Fortunately, Philip had his first aid kit which basically consisted of small tissues, this stopped the blood flow but not the pain or pride. Always wear a helmet, even when off the bike. 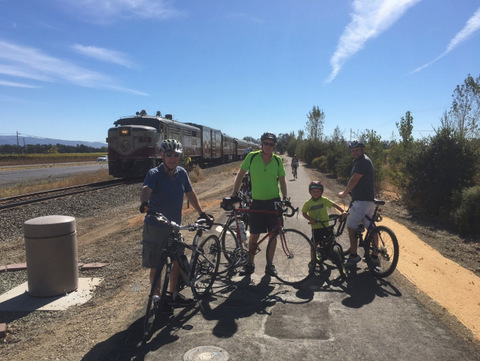 a bicycle ride on a safe bike path away from cars – satisfaction and renewed appreciation of beautiful Napa Valley. A bunch of guys having a grand day out. We said our goodbyes and will return.